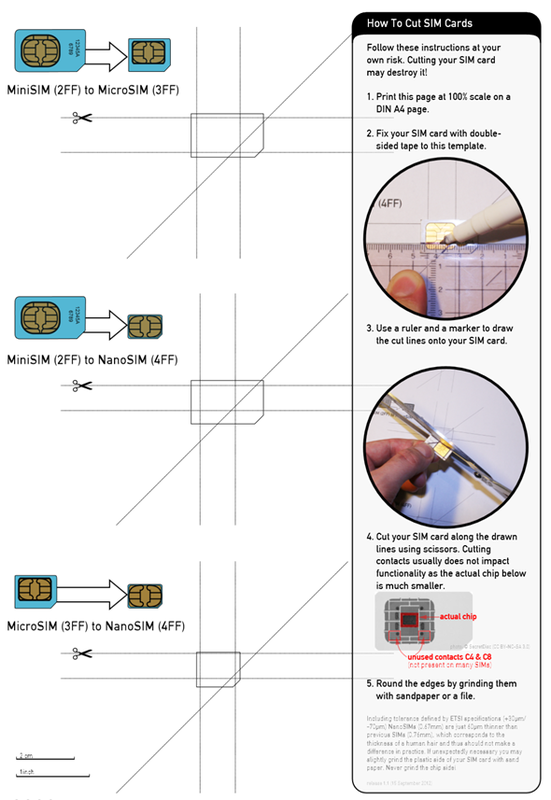 While searching more about Nano SIM for iPhone 5 I found that it’s possible to convert Micro SIM into a Nano SIM as mentioned just before post and interesting its easy procedure. Although required lot’s of patients and perfectness. Other get Nano SIM Cards from respective operators. I would like to mention here some easiest step which also I have read and learn from idownloadblog.com and airportal.de. Dame one really for iPhone lover who don’t want to go outside for Nano SIM try it it’s have fun. And do it on your risk because while trying same had already lost one SIM. 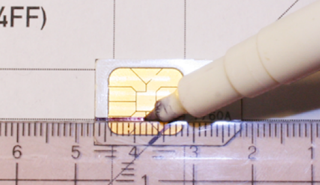 Before planning to Micro SIM into a Nano SIM at home you will require the subsequent equipments like a printer, A4-sized page, tape, ruler and marker, scissors, sandpaper or file. First of all take a print out of the above Image here at 100 percent scale on an A4 page. Then after user have to place Micro/Mini SIM on the noticeable area of the A4 page just printed, as shown in the illustration beyond. For example, if experiment user have a Mini SIM, it should be placed on the second marked area and a Micro SIM must be placed on the third and last. More over follow to fix SIM using dual sided tape to the given template painted outline on the A4 page. Make sure that its edges are aligned appropriately. Then after using a ruler and marker, draw the five lines by the side of which experiment user have to cut the SIM. To end with cut the SIM gradually and watchfully. Be warned that user have damaged their SIM if ended incorrectly. Cutting beside the edges of the SIM does not impact its functionality, as the chip inside is much smaller. 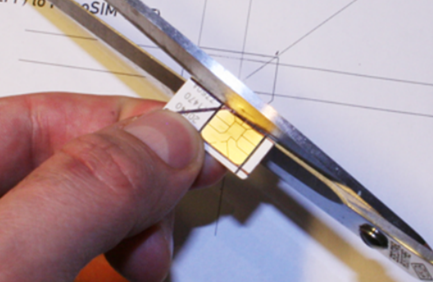 Finally, even out the edges of your freshly cut Nano SIM using sandpaper or a file. Once again exercise caution to avoid accidental damage to the SIM card's circuitry. 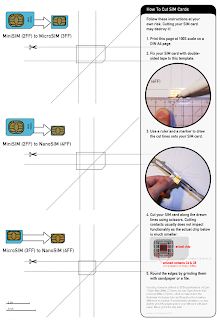 I would like to present videos of How to Convert Micro SIM into Nano SIM For iPhone 5, as I strongly believe practically saw thing becomes great guide always more than theoretical steps.Which helps me during same task while I am cutting Mini or Micro SIM in to Nano SIM for iPhone 5.